The island’s school garden program is blossoming, but this year it’s getting the biggest boost in its five-year history. FoodCorps, a national non-profit program in partnership with the AmeriCorps service network that addresses childhood obesity and food insecurity, has assigned five members as full-time to Big Island schools. Another three members are assigned to schools on Oahu and Molokai. Redfeather said about 1,000 applications from around the nation were submitted for the 125 service member positions and she received a list of 83 qualified applicants for the eight Hawaii slots. While the school principals made the final selections, Redfeather said she was able to give the principals a short list of applicants who most closely matched their communities. For example, Redfeather listed desired qualities such as knowledge of local culture and values, dedication to healthy communities, a sense of responsibility to foster youth, and the willingness to develop innovative practices to build food systems. Jessica Sobocinski, 22, recently graduated from the University of Indiana with a degree in anthropology, but is looking forward to learning about Hawaii’s culture and her new young charges at Honaunau School. Sobocinski said she has been especially impressed by the students’ enthusiasm and commitment. Amelia Pedini is coordinating the FoodCorps Hawaii program and be the liaison between The Kohala Center, FoodCorps Hawaii service members, and the national FoodCorps team. The Boston native said Hawaii has some obstacles and some advantages. Pedini said FoodCorps sees so much opportunity in Hawaii. The service members will also be part of the Ku Aina Pa program, a year-long school garden teacher training course funded in part by a USDA/SPECA “Ag in the Classroom K-12” grant to The Kohala Center’s HISGN program. The eight schools selected as service sites are committed to building garden-based nutritional education programs, and expanding the connections between hands-on learning and core curriculum. * Knowledge: FoodCorps service members teach children about what healthy food is and where is comes from, while integrating these activities into academic subjects Service members strive to increase both the quality and quantity of this education by identifying, adapting, and creating curriculum materials and working with teachers to integrate ongoing series of food and nutrition activity lessons into classes as diverse as health, math, English, and science. * Engagement: School gardens are powerful gateways to encouraging children to try new foods. Service members grow healthy food with students, teachers, and community members in school gardens, which serve as dynamic educational settings where kids can get their hands dirty and experience what they are learning first-hand. * Access: Service members increase children’s access to and information about healthy food in school cafeterias by working with schools to offer their students opportunities to eat nutritious meals made up of the foods they’ve studied and grown. In Hawaii, service members will work with their schools’ USDA Fresh Fruit and Vegetable Program to source in-season, locally produced fruits and vegetables for morning snacks. FoodCorps Hawaii will work with the state Department of Education’s Office of Child Nutrition to begin building relationships between Hawaii farms and local schools. Waimea Middle School principal Matt Horne said when these three pillars of FoodCorps’ approach are implemented, students’ attitudes toward the consumption of healthy food is improved. Children adopt healthier lifestyles, improve their academic performance, and obtain real-life learning experiences about sustainability and eco-literacy. In its first two years, FoodCorps gained national attention by providing an innovative, grassroots, and scalable approach to solving the United States’ childhood obesity epidemic. Since 1980, the percentage of American children who are overweight or obese has doubled. With one in four children struggling with hunger and one in three obese or overweight, FoodCorps addresses the root cause of both: access to healthy food. FoodCorps has expanded its reach and grown its ranks every year since its inception in 2011. 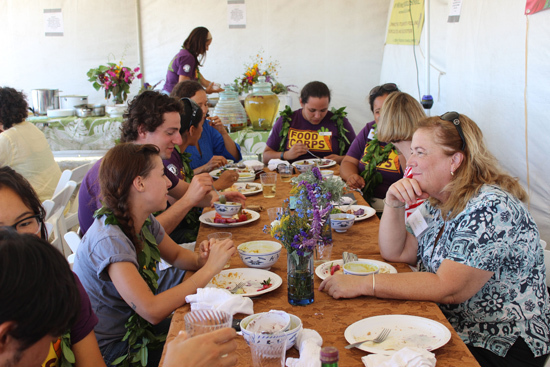 Following a welcome celebration at Waimea Middle School, the FoodCorps fellows were treated to a lunch that featured a variety of locally grown foods. Hawaii County Councilmember Margaret Wille was among the dignitaries who welcomed the FoodCorps fellows. 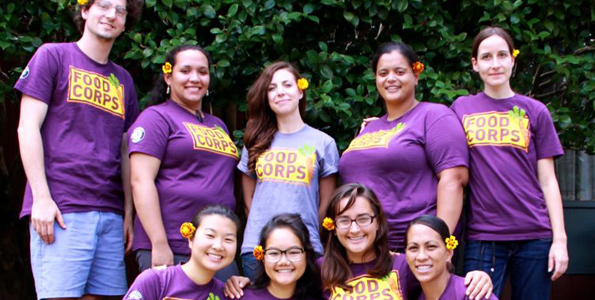 Eight FoodCorps service members have been chosen to serve for a year at public and charter schools in Hawaii. The year-long commitment began Sept. 1 and will earn each $15,000. Funding for FoodCorps is provided by the W.K. Kellogg Foundation, AmeriCorps, and a diverse array of private and public donors. The Kohala Center is the host site for Hawaii’s FoodCorps Program. Operating in 15 states, FoodCorps added Hawaii, California and New Jersey to its roster for the 2013-2014 service year. The Kohala Center is an independent, community-based center for research, education, and conservation. The center was established in direct response to the request of island residents to create greater educational and employment opportunities by enhancing — and celebrating — Hawai‘i’s spectacular natural and cultural landscapes.